In the space of a week, I’ve gone from the heights to the depths. Last week, I was thrilled to learn that my book, Wisdom, the Midway Albatross was given a starred review in Publisher’s Weekly. This book has defied all the odds–just as Wisdom has done. 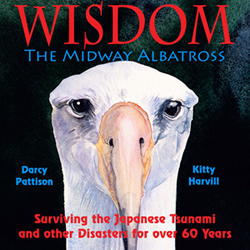 The story is about a 60+ year-old albatross who lives on Midway Island and survived the Japanese tsunami. For over 60 years, she has soared over the North Pacific, only coming to shore to breed. Scientists estimate that she has hatched over 35 chicks, including one each year for the last five years. Last year’s chick was named Wonder and this year’s chick–just a couple weeks old now–was named Mana’olana, Hawaiian for Hope. Yes, a 62-year-old bird just hatched a new chick! After the 2011 Japanese tsunami, I heard her story of survival and within six weeks, I had contacted scientists, researched her life and times and written her story. I contacted about twenty publishers and none would publish it. I decided to work with my long-time friend, wildlife artist Kitty Harvill to publish it from my own imprint, Mims House. Now, I’ve been in this business long enough to know that it would be a long hard road. But it was an important story, one I couldn’t let go. It won the Children’s Book category of the 20th annual Writer’s Digest Self-Published award, a $1000 cash prize. So, I submitted it to Publisher’s Weekly for review and it earned a Starred Review! Right now, it is an Amazon bestseller (for the spring season, the ebook version is only $0.99). The starred review was especially nice, because it was a validation of all the work we had put into the book. Go look for yourself: self-published can be quality. Publishing has weird math. 9 months + 5 revisions = NO. The rejection I got yesterday was shocking and painful. For nine months, I have been working with someone on a project and it has developed in amazing ways. The critiques were spot-on and I revised like crazy. I deleted chapters, added chapters, rearranged chapters, deepened characters, searched for ways to add humor. Then, I did it again: I added a character, took out a subplot, deepened characters and searched yet again for ways to add humor. I expanded the climax scene, set it up better. I created a stronger emotional arc, added a stronger villain. I revised. I love this story now. The world tilted for me yesterday. Nine months. Three major (huge, gigantic, difficult, rewarding) revisions and a couple more minor ones. Yet, the moon rose as usual, I slept. The sun rose as usual, I got up and showered and ate breakfast. I have already queried someone else and will send it to them today. I am raw. I feel wounded. A trust betrayed. A grieving because they couldn’t see the story in front of them; they only saw what they would have written, if only they were writers. Are they right? Are they wrong? I only know that this is a heartbreaking week, but last week was an uplifting week. This is just the heights and the depths of our profession; somehow, it feels normal. And regardless of the reaction of others to what I write, my job is to plod along putting one word after another. So, today, I will write. That’s so true, Darcy. The writing life is a roller coaster, even though we writers try to make it as stable as possible. Try not to be too discouraged. It’s still good. You’re still good. It might just not have been the right fit to that person. I’ve recently had a book accepted, and received a rejection for a book I loved with great enthusiasm–in the same week. You so eloquently put pain to page–and sharing it with you makes mine feel lessened. We will continue to write, the moon will continue to rise, and like the tide it influences, our successes will naturally ebb and flow. Here’s to a high tide for you–very soon! Thank you so much for sharing these ups and downs with all of us. First Congratulations for the starred review! And for being brave enough to put Wisdom the Midway Albatross out there on your own. Second, we’ve all faced these kinds of discouragements in this wild ride of a writing life. You sharing yours helps me with my own, and I agree with the other comments. It’s still good. You’re still good. In time the tale will find the right home. Sorry, Darcy. That’s so painful. I’m glad you got the starred review first, to bolster you. Maybe the person who ends up loving the same story you do will be a better fit for the story as a whole. What is painful now may make more sense later. If nothing else, pain makes us better writers! (Not that I’m advocating masochism….) Thanks for sharing all you learn with the rest of us. And here’s a happy dance for the starred review! Darcy, this is a tough rejection. But it sounds like all your hard work could still pay off! Good luck as you go once more into the breach with the next submission. Hang in there Darcy! You are an amazing writer and all your hard work will pay off, just as it did with Wisdom! Thank you for all you do to help the writing community! Starred review!! Awesome, Darcy. Midway will be a gold standard for self-publishers out there. As for the rejection, boo. I reposted your post because you illustrate that persistence is a crucial piece of success in this industry — and life in general, eh? Thanks for being so open about your feelings. It encourages us to know we are not alone when those big disappoints come and shows us how to face them with determination to use them as steppingstones to prove we do know what we are doing/writing. We we will persevere until we find a publisher who understands our stories and sees they are worth publishing/sharing with the world. Bless you. Darcy, I’m so thrilled for WISDOM’s success. Validation is the sweetest feeling…. I’ve had the same thing happen with a novel, so I very much appreciate your honesty – a reminder to all of us that we aren’t alone on the coaster. Kudos, Darcy on the starred review and awards and Amazon ranking and sales of WISDOM! To encourage you, and other writers, I just signed a contract for a novel I wrote in 1991. My last revision on NO SURRENDER SOLDER was based on revision notes from my agent. But she left the agency before submitting any of my work. So I sold the novel by myself to Jacquelyn Mitchard at Merit Press. Looking forward to hearing your story in the future when you sell this book that was just rejected. Bonne Chance!